Bauer AW, Kirby WM, Sherris JC, Turck M :”Antibiotic susceptibility testing by a standardized single disk method.” Am J Clin Pathol. 1966 Apr;45(4):493-6. The “Kirby-Bauer” antibiotic susceptibility test is another standard method that you should cover in microbiology class. The method involves getting a pure culture of the bacteria you want to treat, and then growing it in a petri dish. By putting paper disks soaked with various anti-bacterial substances, you can identify which ones are most effective at killing (or at least stopping) the bacteria in question – for example if you’re trying to figure out what kind of antibiotic to give to the guy coughing up some unknown plague in your doctor’s office… The anti-bacterial substance that the paper is soaked in slowly diffuses into the area around it on the petri dish, getting more dilute the further it gets from the paper. You can then estimate how powerfully anti-bacterial the stuff is by how far from the paper the bacteria stop growing. The authors here didn’t invent this trick. Not all antibiotic-susceptibility tests are “Kirby-Bauer” tests (the blurry picture there is of an experiment I did involving the beer ingredient hops, and is not a Kirby-Bauer test. Click the picture to go to my “Beer Cures Anthrax” post from long ago…). What this paper describes is a method that finally standardized this test. 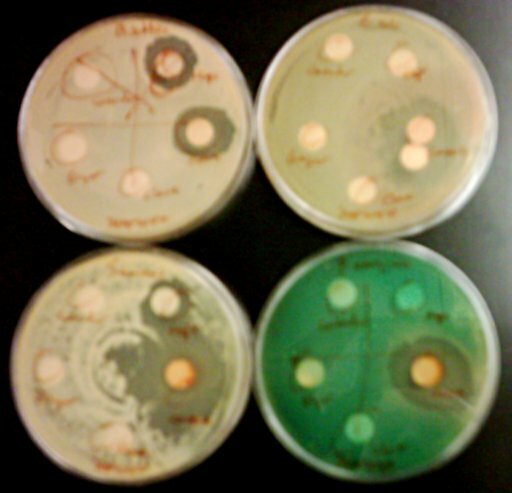 Instead of having to use multiple paper disks with different amounts of the same substance, the “Kirby-Bauer” test prescribes specific concentrations of each antibiotic, and specific nutrient agar formulations, and so forth, so that determining which antibiotic your mystery bug is best treated with can be done in a way that gives consistent results regardless of who is performing the test. The method is regularly updated to account for new antibiotics, but is still referred to as the “Kirby-Bauer” antibiotic susceptibility test to this day. Incidentally, the American Society for Microbiology kindly hosts a reprint of this paper as a .pdf file, so you can read it yourself if you’d like.